Another GMA TV show saw them joining us at Amazon BKK2 near Bangkok. With the subject of the show being the Arapaima and only one day to get the footage the GMA guys made an early start at Amazon BKK2. With lots of Arapaima regularly topping across the lake the angler quickly began casting at the various Arapaima with his lures. After several slow retrieves a savage take saw the spinning outfit at full compression as an angry Arapaima threw itself out of the water. The Arapaima was landed without incident and was estimated to weigh 25kg. Further casts produced more strikes with several fish falling off due no doubt to their bony mouths. As the mornings angling progressed another take saw the GMA guys attached to yet another Arapaima. The Arapaima on this occasion was much bigger and gave a good account of itself on the medium weight spinning outfit. The battle lasted for twenty minutes as the angler carefully played the Arapaima. The Arapaima was netted shortly after and placed in a recovery sling. The Amazonian Arapaima was displayed proudly for the camera and was estimated to weigh 40-45kg. The days fishing at Amazon BKK2 continued with several more Arapaima falling for the lure fishing tactics. 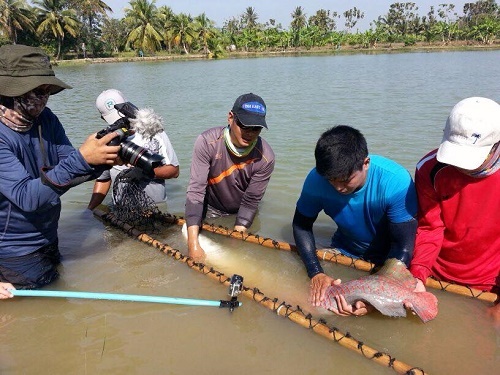 At the end of the days lure fishing at Amazon BKK2 the GMA team had landed six different Arapaima and got plenty of footage for the forthcoming show.